Discover the Marbler in You (Or Someone Special)! For the past 10 years, it has been my mission to "bring marbling to the masses." I have exposed people to the beauty and wonder of this gorgeous art form through in-person demonstrations, print and online interviews, my social media outlets, and collaborations with production companies. I have also been so fortunate to be able to teach people all over the world how to create their own marbling magic at home. Whether I am working with them side-by-side or virtually, taking students on the journey to discover the marbler in them has been one of my greatest pleasures. And now I'm making it easy for you to join me in giving (or receiving!) the gift of discovery with this deeply discounted, limited time offer. 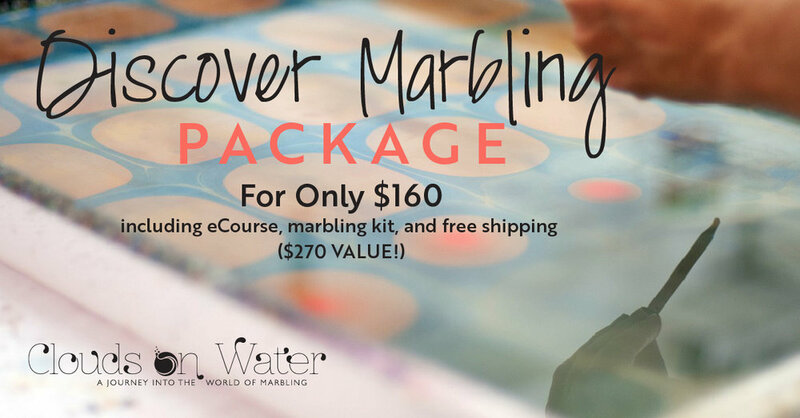 to give yourself or gift to someone else a unique experience into the rich, dynamic world of marbling. Or upgrade to the Discovery Complete Experience for just $125 more and receive LIFETIME access to ALL THREE marbling classrooms! That’s a savings of $163! Ready to Purchase the Packages? Click Here! Offer Details: Free shipping in the US only. Kits will be mailed out the week of December 4. Offer good November 22 through midnight EST November 27.